At first my hormone level seemed really low (37) after two weeks though it jumped to 4,880. At 10 1/2 it was 186,489. 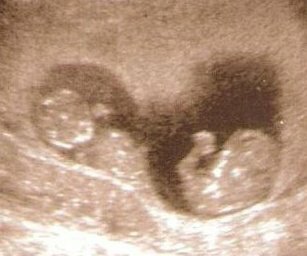 I had a feeling the whole time that I was carrying twins and I went for an ultrasound at 10 1/2 wks and asked the tech if it was twins, she smiled and brought in my husband. They have a membrane in between them, although in this pic it's hard to see. Twin B is 1 cm smaller. They found a small bleed outside the yolk sacs. I am praying that they both will be okay.